← Banish those February blues at the farmers’ market…. February has lived up to its reputation as a dismal month for me and I am happy to be waving it goodbye. I managed to write my lovely 18th month old Golf off driving down a country lane at midnight on the last day of January, when a bend in the road hid what had turned the road into a small but forceful river. Three weeks of endless phone calls and messing around and I have only just sorted with my insurance people what I will get to buy a replacement. So I missed last month’s Penshurst market standing in a lane near Blackham waiting for the breakdown man to come. But now, thank goodness, March is here – so it’s a warm welcome to longer days, a reprieve from the flooding (fingers crossed), and the distant promise of the new growing season. My garden is going crazy with the warm temperatures, and I have snowdrops, crocuses, daffs and primroses all madly competing for attention. And, having missed last month’s market shop and being too busy writing my wonderful new book (about which more in future posts) to get out to my local farm shops, my cupboard is bare and I head to Penshurst this Saturday with a very empty basket. Here’s some tips on what I will be looking out for…..
March is known as the hunger gap or famine month, as we have to wait for longer days and warmer weather to stimulate the new season’s growth. And with the record rainfall and floods of the last few months, farmers and food producers are struggling to harvest what is still available. 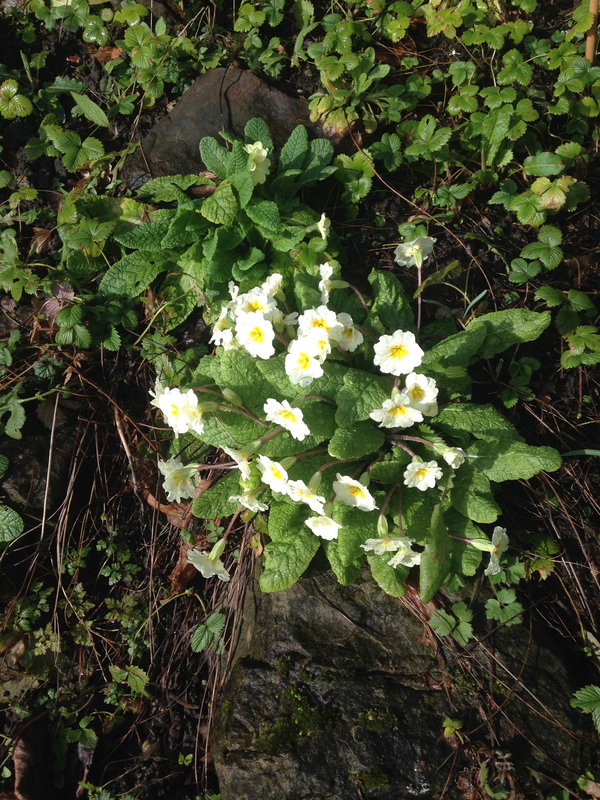 But don’t despair, for spring really is just around the corner. At the end of the month the clocks go forward, so why not make the most of the last of the winter at the Farmers’ Market this month, and savour all those wonderful comfort foods. After all, that’s one of the real joys of seasonal local shopping – life moves on, ingredients come and go with the changing year, and we can all enjoy knowing we are eating food at its finest whilst giving vital support to local producers who are working flat out to cope with the challenges the British weather keeps throwing at them. For fish lovers, sea bass is a good choice this month, or try a wonderful warming fish stew as a superb way of enjoying superb local fish and seafood. Or spoil yourself a little with wonderful local lobsters and native oysters, clams, cockles and mussels. 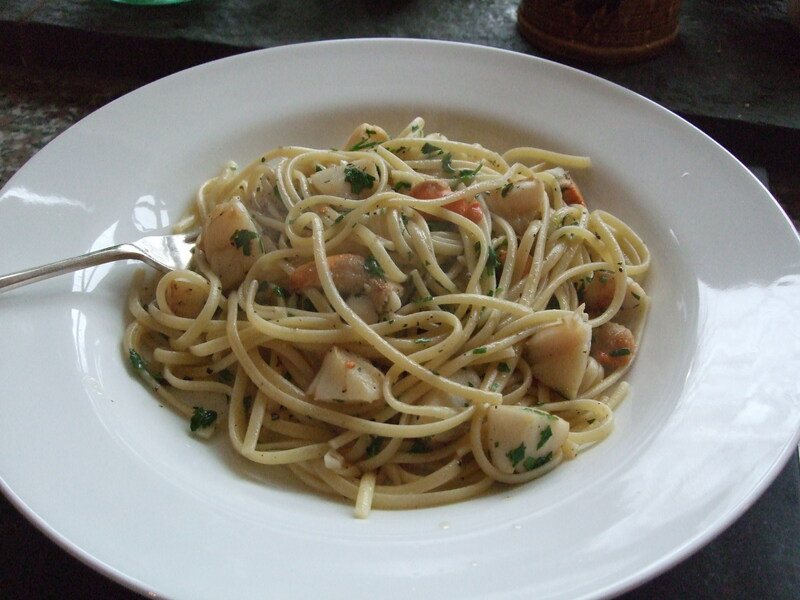 Storms permitting, Kent and Sussex scallops are at their finest now so enjoy one of the great pleasures of the season. Try them in the simple pasta dish below. For meat eaters, pork is an excellent choice this month and it’s still ideal weather to enjoy a hearty roast on Sunday with all the family. Try a shoulder joint for the best combination of flavour and texture. The cheaper cuts are worth trying in slow cooked stews and braises – pig’s cheeks and pork belly, breast of lamb, shin of beef – all great value and superb eating. Rough shooting takes over as the end of the season has arrived for many game birds so rabbit and wood pigeon are both good eating now. And if you haven’t had venison this winter, try some now maybe in burgers or sausages with steamed kale and mashed root veg. Cabbages, cauliflower, purple sprouting broccoli, leeks and kale are all good in March where fields have escaped the floods to allow for harvesting. They need little cooking and are really at their best simply shredded and steamed. Or try quickly stir-fried with garlic, ginger and chilli for an accompaniment to good local sausages. Cauliflower goes really well with curry spices so try it in vegetable curries, soups and fritters. And make the most of leeks, carrots, swede and Jerusalem artichokes before they disappear. Beautiful pink forced rhubarb is really the only local fruit around now but the season is short so make the most of it. Use in crumbles, fools, ice creams and sauces – it goes particularly well with a large pinch or two of ginger. Or make up batches of rhubarb compote and freeze in pots for later in the year. Don’t forget that local apples are still good as the storing varieties go on delivering flavour and texture until April. 1 Cook the pasta in a large pan of salted boiling water according to packet instructions. Keep the water at a good boil to avoid the pasta sticking and don’t stir apart from when you first add it to the water. 2 When the pasta is nearly cooked, heat the oil in a medium frying pan. Add the scallops and saute quickly over a high heat to seal and brown. Add the garlic and chilli and cook for half a minute – don’t allow to burn – then add the wine and boil to reduce by half. Stir in the parsley and seasoning and add a squeeze of lemon juice. 3 Add a splash of cold water to the pasta to stop it cooking any further (this is a tip given me years ago by a Sicilian friend to stop pasta sticking – no oil needed – and it works! )then drain thoroughly. Toss with the scallops and all their lovely juices. Serve immediately in warm bowls. This entry was posted in Farmers Market, In season, Local food and tagged Kent farmers markets, march seasonal food, Penshurst farmers market, scallop recipe, Scallops, What to buy. Bookmark the permalink.